Bedford Town suffered an Easter weekend with no points, after losing to Kettering Town on Saturday and St Ives Town on Monday. Playing in front of a crowd of 974, Bedford entered a hostile Latimer Park against old adversaries, Kettering Town, with the home side looking to land the Central Division title. This was never going to be a classic, with Kettering looking nervous against a resurgent Bedford side. Garry Malone was first up, saving a tame shot from David Kolodynski, then on six minutes Callum Lewis failed to keep his 25-yarder below the bar. Midway through the half, Rob Parker beat James Jepson for pace, after a long kick from Malone. With no-one near, Parker entered the left corner of the area before unleashing a shot that Richard Knight got a hand to before Jason Lee cleared. Brett Solkhon should have given Kettering the lead on the half hour, when James Clifton headed the ball into his path. However, from close range Solkhon blazed his shot over the bar. The second half was scrappy, and extremely physical, with neither side gaining an edge. Bedford attacked from the start, but Jon Bukasa’s shot was tame and easy for Knight to pick up. Malone then saved well from Kolodynski’s header, before Paul Cooper shot wide after an error from Knight. With 86 minutes gone, and the game looking like it was going to end in a stalemate, Kettering took the lead. A free-kick was not cleared properly and the ball landed at the feet of Jason Lee, who lashed home into the back of the net. Two minutes into stoppage time the lead increased as Andy Gooding took a quick free-kick, allowing Elliot Sandy to slot the ball home. Despite the defeat, the last 15 minutes of the game featured the return of Bedford’s top scorer, Tom Liversedge, who had been out through injury since late January. 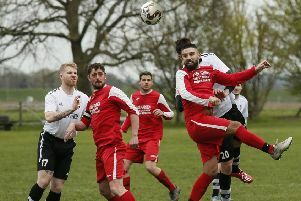 Kettering, meanwhile, had to wait to win the division, after Aylesbury FC beat North Greenford to keep their very slim hopes alive, but they did clinch the title on Monday as Aylesbury FC could only draw 0-0 in their derby fixture with Aylesbury United. Eagles: Garry Malone, Callum Lewis, Jon Bukasa, Ross Oulton, Josh McGoldrick, Ollie Wilkinson, Stuart Smeathers, Rob Parker (Luke Fairlamb 80), Curtis Shaw (Tom Liversedge 75), Joe Curtis (Jordan Davis 87), Paul Cooper. Subs not used: Josh Winters, Greg Ling. Poppies: Richard Knight, James Clifton, Steve Kinniburgh, Gary Mulligan, Brett Solkhon, Jason Lee, Andy Hall, James Jepson (Andy Gooding 71), David Kolodynski (Tommy Hull 88), Elliot Sandy, Josh Moreman (Dubi Ogbonna 56). Subs not used: Jamie McAlindon, Ash Robinson. Over to Easter Monday, and Bedford were on their travels again; this time into Cambridgeshire to face St Ives Town. Tom Liversedge, Jordan Davis and Greg Ling were the three changes to the side, with Joe Curtis, Curtis Shaw and Paul Cooper making way. The first chance of the day fell to Liversedge, but his shot from the edge of the area was comfortably saved by Tim Trebes in the St Ives goal. With 16 minutes gone, Ben Seymour-Shove’s 22-yard free-kick was pushed round the post by Garry Malone. From the corner, Scott Sinclair skied the ball over the bar. An audacious, angled chip from Greg Ling on 20 minutes beat Trebes, but also cleared the bar, and it was St Ives who took the lead a minute later. A long ball down the left found James Hall and, after outmuscling Ollie Wilkinson, Hall fired in a shot that was too powerful for Malone to keep out. Liversedge had the ball in the back of the net on 31 minutes, but the effort was ruled out for offside. Bedford equalised 11 minutes into the second half when a short corner was dummied, and Rob Parker came in to slam the ball into the roof of the net. However, St Ives regained the lead on 64 minutes when Jack Higgs’ free-kick beat the wall and Malone. With 20 minutes remaining, Bedford had a penalty shout when Ling’s shot clearly hit the arm of a defender, but the referee saw it as ball to hand and waved play on. Malone was felled in a collision with Will Muzuimbiri, and as the ball ran free with no whistle to be heard, Wilkinson raced back to deny a certain goal. As the game was closing, Ling shot wide after Curtis Shaw had set him up, then Shaw saw Trebes save his shot after Paul Cooper had crossed in from the right. The two defeats have halted Bedford’s climb to a respectable position up the table, and the side slip down to 17th. As the end of the season nears with just three matches left, Bedford play their penultimate home match on Saturday when Godalming Town visit the Eyrie for a 3pm kick off. Eagles: Garry Malone, Josh Winters (Joe Curtis 41), Jon Bukasa, Ross Oulton, Josh McGoldrick, Ollie Wilkinson, Stuart Smeathers, Rob Parker, Tom Liversedge (Curtis Shaw ht), Jordan Davis (Paul Cooper 68), Greg Ling. Sub not used: Kerran Birch. St Ives: Tim Trebes, Harry O’Malley, Jonny Hall, Jordan Lambert, Luke Smith, James Peters, Ben Seymour-Shove, Jack Higgs, Will Muzuimbiri, James Hall (Kieran Fitzgerald 90+4), Scott Sinclair (Charlie Death 87). Subs not used: Dan Moyes, James Horrey.